Often referred to as ‘the Paris of east’ the city of Budapest makes for a truly romantic break away with something to entice all couples wanting to enjoy a little romance. From walks along the iconic boulevards and promenades to enjoy some precious alone time, to visiting one of the many festivals the city plays host to, there’s always something new to embrace in Hungary’s scenic capital. Like most European cities, exploring by foot means you’ll be sure to stumble upon some local treasures and once you’re done walking round, heading to the spa for some relaxation in the warm waters of the natural thermal baths is not to be missed. Spend your evenings sipping cocktails in the heart of the city at one of Budapest’s open-air cafes or dine in one of the cosmopolitan neighbourhoods; no matter your itinerary, you’ll soon fall head over heels for the magic of this beautiful city. You don't have to spend a fortune to discover everything this city has on offer either, browse our guide of things to do in Budapest for less than €30. That’s amore. Continue your love story as you explore Italy’s captivating capital. Home to some of the most spectacular sights across Europe including the iconic Colosseum, Rome is a truly romantic holiday destination all year round. From day to night, the mesmerising city is a delight to discover and there’s no better way than strolling the atmospheric streets hand in hand. Both a haven for history lovers and a must-visit for foodies, the city really does have it all. 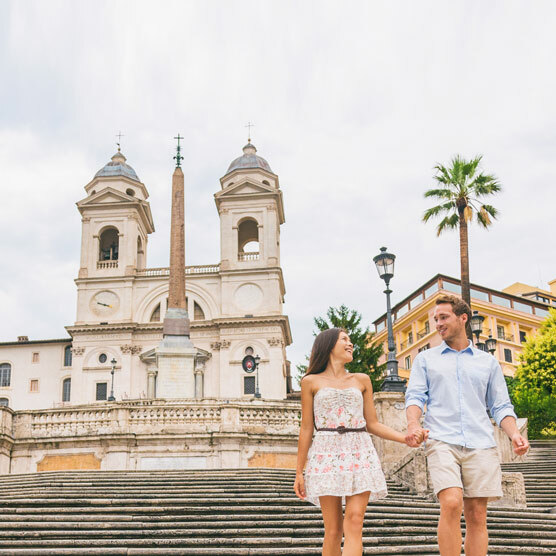 Make a wish together at the Trevi Fountain, visit the striking Sistine Chapel, or stop by the stunning Spanish Steps. Indulge in gelato as you walk the ancient streets and be sure to stop for authentic pizza and pasta in one of the city’s quaint restaurants for a true taste of Italy. With a medieval backdrop and its very own fairytale castle, Prague holds a certain allure that you just don’t find in other cities. Blending the modern and the traditional, there’s something for everyone to explore from ambling along the labyrinth of cobbled streets in old town, to indulging in some of the regions most delicious Czech dishes. A true beauty all year round, Prague is a delight in the summer and just as enchanting all lit up in the winter months, when magical Christmas Markets dot the city squares. In the day, explore the City of Spire’s gothic architecture and lose yourself together in one of many local markets. In the evening, stop by an intimate bar for a nightcap, or for the more outgoing, take note of Prague’s popular nightlife scene. Facing the glistening blue Mediterranean Sea, Barcelona is a city break with a difference as you’re also only a short journey away from the sandy shores if you fancy a romantic walk along the beach. Boasting a vibrant atmosphere and outstanding architecture, Barcelona is a popular destination for couples of all ages. Whether you’re visiting to indulge in a glass or two of Sangria, or travelling to see the famous Sagrada Familia, this Spanish city certainly won’t disappoint. Whilst beautiful all year round and perfect for a long weekend away, it’s the early summer months of April and May that are the best time to visit Barcelona. Start your day with a breakfast picnic in one of the city’s luscious gardens; take a mid-morning bike ride to embrace the wonderful scenery before stopping off to taste traditional tapas together. With a cosmopolitan feel, you’ll be spoilt for choice with local markets, stylish boutiques and hidden gems to indulge in too - and if that's not enough, take a look at our top 8 things to discover in Barcelona and plan your itinerary from there. With its charming cobblestone-streets, Amsterdam is a city rich in culture with a historic beauty that’s instantly inviting. Whether you visit in the spring to see the city in full bloom, or you opt to stay in the autumn as the leaves begin to change, Amsterdam’s picturesque backdrop is certain to steal your heart no matter the season. Wander along the city’s famous tree-lined canals, cosy up in a surrounding courtyard to dine al fresco, or, for something a little more cultural, visit the Museum Region; home to some of the world’s most impressive museums including the Van Gogh Museum and Anne Frank’s House. Don’t miss the worlds only floating flower market too, abundant with the most beautiful blooms around it’s sure to spark a fragrant love affair. The city of love… It wouldn’t be a romantic city guide without mentioning the romantic capital of the world, Paris. From cruising the River Seine under the stars, to a candlelit dinner at the top of the Eiffel Tower, the city is ready and waiting to welcome couples exploring its magical Parisian streets - and it’s every bit as breath-taking as you might of imagined. Renowned for style, there’s so much to fall for in France’s capital. Visit the Louvre Museum for a burst of culture, take a stroll along the Champs-Élysées and up to the Arc de Triomphe to experience a moment right out of the movies, or explore one of the enchanting gardens. Whilst you’re embracing the sights of the city, don’t forget to enjoy a macaroon at Ladurée, stop for a coffee or cocktails in a traditional bistro, or say bon appétit at one of Paris’ foodie gems.